Canik TP9SFX 9mm pistol for sale with cheap shipping, the lowest price, and friendly, helpful service. See DESCRIPTION for review video and specs. 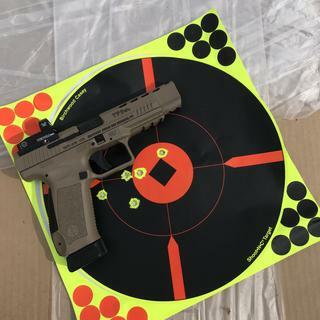 Buy the Century Arms 9mm Canik TP9SFX Flat Dark Earth 9mm 5.25-inch 20Rds and save with cheap, flat rate shipping from GrabAGun, the cheapest online gun store. Have one in Titanium and it is a tack driver at 25 Yds. A lot of bang for the money. Literally. Very well made. Nice trigger. And 20+1 rounds of 9mm/!?!! Really good reviews and unbelievable price. I like the long barrel, extended sight radius and high round capacity. Also it is good to go with included red dot mounting plates which I plan to try for the first time with a Vortex Venom I just purchased. Good reviews adding to 9mm collection good price! In this day and age I want to be prepared to protect my family and home. This gun has very good reviews and large capacity that I feel will help me do just that. 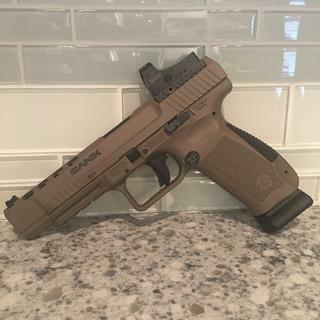 Thanks grab a gun for low price and fast delivery, this is the 3nd gun I have purchased now and wouldn't have been able to do that without you! One of the best out of the box starter competition ready pistols for the money. And the price on grab a gun is hands down crazy low compared to local stores. wanted something I could use with a red dot and for the price seems to be one of the best entry level competition gun. Recommend by friends and great price as well. Great reviews on TP9SFx. And great experience with Grab-A-Gun. Read and watched many videos on this firearm. A lot of “bang” for the buck. GAB always has the best prices. Will be upgrading with Spinco guide rod and spring as well as a Glock red striker spring as suggested by many as well as a Vortex Venom 6moa. 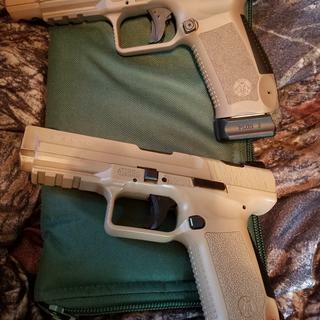 Should be a great combo..
Because I shoot steel challenges with a PT 9sa and I wanted something with a longer Barrel I'm fond of canik firearms.. I've wanted this gun for awhile now. Have yet to find a negative review. Great service and pistol. Shipping was fast and no hassles what so ever! I would buy from them again and recommend grab a gun to others! Quick shipment and hassle free transaction. Not to mention this is an incredible gun with what you get for your money. This handgun will literally make you a marksman. It was like shotting a 22. Put 200 rds of WWW nato and 60 of 115 gr Blazer Brass. Flawless. Great trigger and ergonomics. Pistol is so accurate with the added vortex venom. So much fun to shoot. WOW. I like it a lot. I am considering an Elite to use with these 6 magazines that I also purchased. I installed the 6 lb Glock firing pin spring and the stock Glock safety spring. Now I have a solid wall and crisp 3.75 lb trigger. Sights are dead on at 10 yards. I like the sights. No miss fires in first 200 rounds. I put on the larger back strap. Fit and finish are excellent. Trigger is good for being new and cost of pistol. I bought a TP9SA a few month ago when I needed a cheap high capacity gun to carry while on long motorcycle trips through Texas. Pretty soon I started appreciating that cheap gun so much I decided to add the TP9SFX to my arsenal. Like it a lot, just have to get used to the long take up in the trigger pull. My background: IPSC, IDPA, U.S. Army, LEO, Custom Gunsmith. Back in my shooting days, I shot up around 70,000 rounds annually. I had Winchester as an ammo sponsor thru my shop. I was shopping for a new pistol to carry in non concealed situations. I was looking hard at the XD (M) in 10mm and a friend suggested the Canik. 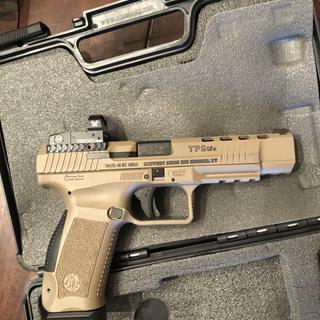 TP9SFX. "Never heard of it!" I said. Found one. Wow. The trigger, the balance, the feel, the way it points... I ordered this one online and it was in my hands in South Carolina the very next day! I have since put a Vortex Venom 6 min reflex on it. I'm now thinking hard about getting back into 3 gun... Find one, hold it, dry fire it and see for yourself. Just put a Holosun red dot on it. Love it!!! Not my first purchase with Grabagun and most likely not my last. Fast shipping, easy ordering and low shipping. The pistol is exactly as advertised. Light weight for a large pistol and shoots smooth with a good trigger and ported slide (not barrel). I like the large capacity and the cool looks. I would purchase again. Awesome gun. I love the trigger and sights. 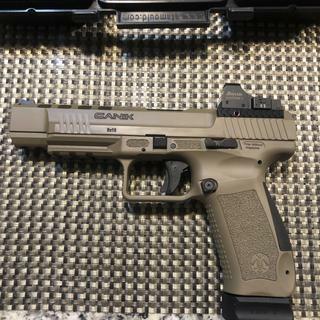 Waiting on my RMR to fully take advance of this baby! GrabAGun again delivered the goods. Low price, fast shipping. Just as expected. 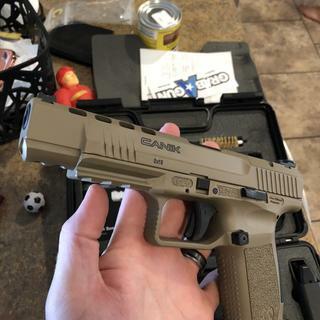 I've been competing in steel challenges with the canik pt9sa.wanted a competition gun the PT 9 sfx has a longer Barrel it shoots well very fond of it can't go wrong with a Canik for the price. this is my tp9sa ars tp9sfx. This was my first time ordering from GrabaGun and was extremely pleased with the speed of their service and prices! Already bought another pistol from here! Love this pistol though! Great range gun with plenty of potential. Would recommend Freedomsmith trigger as soon as possible. My overall impression is very good. Weapon was suggested by a friend and I was not disappointed at all. Weapon feels tight and well made with attachment options available. The weapon came with more accessories than most any other weapon. I am thinking of purchasing another one for a set. Comes with industry standard dovetail sight cuts that are compatible with a large variety of aftermarket sights. Warren Tactical sights with red and green fiber optic front sight. Removable Red Dot cover Rear sight installed in cover to eliminate interference with certain Red Dot sights. Four Red Dot interface plates. Match grade barrel. Improved single action trigger with 3.5 4 lb. pull. Lightening cuts on slide to reduce muzzle rise. Forward slide serrations. Reversible ambidextrous cocking lever. Extended ergonomic slide stop. Adjustable length reversible magazine catch. Two extra sizes of magazine catch extension (addition to standard magazine catch). Striker status indicator. MIL-STD-1913 Picatinny rail. Tungsten grey cerakote over phosphate. AFC magazine coating. The TP9SFx comes with two 20 rd. mags., poly holster, paddle/belt attachment, interchangeable backstraps, cleaning rod, brush and a limited lifetime manufacturer's warranty. Compare features and see the Canik TP9 family of pistols.